A comprehensive look at the various groups of children that professionals encounter in their work according to diagnostic categories, the unique issues that relate to those diagnostic categories, and approaches to effective assessment and intervention. This book provides comprehensive coverage of children who do not acquire language normally, their characteristics, and how to help them successfully develop language skills. It begins with an overview of the aspects of normal language, looking at the bases of language and communication and at normal language development in children and adolescents. Here readers get a review of the concepts, as well as an introduction to the rest of the book. The central focus of the book features nine chapters on the language difficulties of different groups of children, including groups defined by the age of the children in combination with an etiological condition, and groups defined by concomitant or etiological conditions associated with the children’s language difficulties. 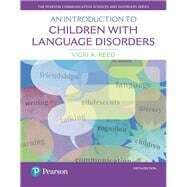 The final part of the text presents more detailed discussions of language intervention, including augmentative and alternative communication as it relates to children with language disorders and their interventions; language assessment; and the procedures used and factors considered in intervention with children with language disorders. Thoroughly updated to reflect the most current knowledge in the field, the new edition also includes current information about federal education laws and initiatives that affect services for children with language disorders. Dr. Vicki A. Reed, CCC-SLP, is a two-time Emeritus Professor—James Madison University and The University of Sydney. She holds is an ASHA Fellow, a Board Certified Specialist in Child Language (BCS-CL), and until recently a Certified Practising Member of Speech Pathology Australia. Prior to moving to the Shenandoah Valley, Virginia in 2004 and James Madison University, as Head of Department of Communication Sciences and Disorders, Dr. Reed had been Head of the School of Communication Sciences and Disorders in Australia at The University of Sydney for 17 years. In addition to her work in Australia and USA, she has provided consultancies in New Zealand, the USSR, and Thailand, among others. Until retiring in 2016, Dr. Reed had amassed 40+ years’ experience teaching and researching in the area of child and adolescent language development and disorders at the graduate and undergraduate levels, including mentorship of students' research. She has numerous publications and presentations in the area. So Which Ones Should We Use?